Here LW works out as 722 mm using a 1.25 mm diameter wire (resistivity of copper is 1.7x10e-5 mm). It's best to wrap up the wire so as to minimise its inductance. You can do this by wrapping it back and fourth as shown below. Note that there is an inherent inductance in any conductor - even a straight wire. This arises due to the flux which exists inside the wire (this gives rise to the skin effect) and is independent of the diameter of the wire. The value of the internal inductance is 5e-8H/m which is insignificant compared to typical coil inductances of several uH. Alternatively, you could wrap the wire so that the turns are wound in alternate directions. This does have quite a lot of inductance compared to other winding configurations so it is best used for low frequencies, if at all. The current sensor module is wound with 1.25mm wire, with the current terminals made from brass. 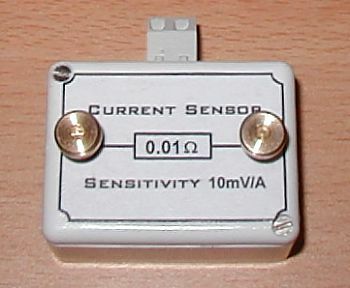 The sensor voltage is brought out to a screw-less terminal block. After several attempts at getting the winding length correct the accuracy of the sensitivity is better than +/- 2%. The inductance is less than 1uH. I made this sensor using constantan resistance wire so that the wire length and inductance would be minimal. Fig 5. Constantan element sensor. The accuracy of the sensitivity is better than +/- 2%. The inductance is primarily internal inductance and so it is irrelevant unless the frequency of the current approaches several hundred MHz. The limiting factor with this sensor is the skin effect which causes more charge to flow close to the outer surface of the wire than in the bulk of the conductor - the resistance is frequency dependant. This sensor consists of several strands of wire to reduce the skin effect but the useful frequency range is still limited to about 400kHz. This sensor design is based on a commercially available 0.01 resistive element. The element is reshaped to reduce inductance and a coaxial lead is soldered directly onto the ends of the element. Fig 6 shows the completed sensor with BNC terminated coaxial lead. 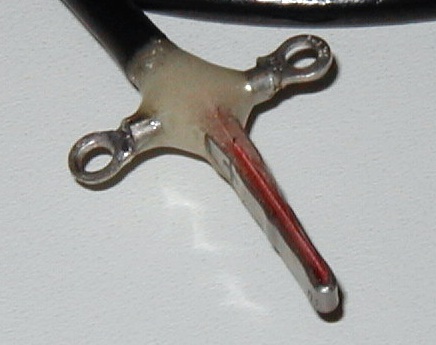 Fig 7 is a close up of the sensor element. Note the thin red plastic strip separating the opposing sides of the element. Fig 7. 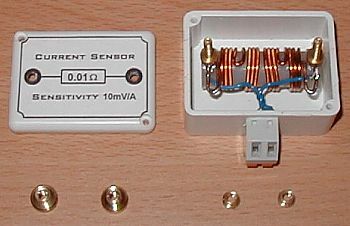 Sensor element with plastic seperator strip.